Synopsis: Loyalty and betrayal. Lovers and enemies. The final installment in the heart-stopping DUSTLANDS trilogy, which began with the Costa Award-winning BLOOD RED ROAD and continued with REBEL HEART. Saba doesn't know who she is any more. Her encounter with DeMalo leaves her drawn to the man she knows should be her enemy. She has no choice but to continue to lead the fight against him. Saba knows the price of violence. She has lost too much in the quest for freedom. Now she must decide if it's worth the fight. To celebrate the release of Raging Star we’ve got a great interview with Moira herself. The GIVEAWAY is at the bottom of the review. 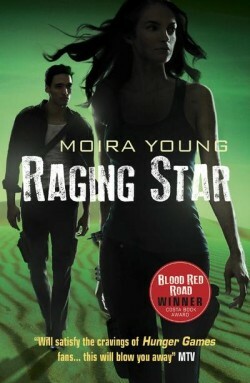 Moira Young’s Raging Star, the third and final novel in the Dustlands Trilogy, has finally hit the shelves and with that a final sigh of relief for all those who were hooked by Saba’s tale in Blood Red Road. And contrary to what you might expect, the climax lies not in gun and knife-fights but in a different kind of resistance that poses a whole variety of other challenges – and is just as exciting once it gets going. What strikes me about Raging Star, above both Blood Red Road and Rebel Heart, is the western themes that permeate the entire book: with Saba isolated even from her own friends whilst she bears several heavy secrets, she embodies the lone ranger figure. Coupled with allies, of which there aren’t really many, Raging Star does evoke film classic The Magnificent Seven, especially in their desire for a (relatively) peaceful resolution rather than an impossible-to-win out and out war. Raging Star sees most of the conflict and tension move from a more adventure lead story – as in Blood Red Road – to the internal struggles of the group that began in Blood Red Road. With a traitor amongst their midst, Raging Star turns into more of a John le Carre style tale of moles and double agents. I have to admit that my instinct for the traitor(s) was correct, which somewhat robbed the surprise that might have been achieved in the stand-off – though speaking to my father, this wasn’t necessarily obvious and he seemed to have an entirely different view. The only real criticism I have of Raging Star is that much like Blood Red Road, Young does take her time getting on her feet, and there is a sense that she is rediscovering her direction in the first quarter of the book that means that the real excitement – the grand plan to collapse De Malo’s New Eden – isn’t maximised to the extent that it could have been. As such it feels rather brief and fleeting. As a whole, though, Raging Star is still a wonderful culmination of this great trilogy, concluding Saba’s journey in unexpected ways. What I love about Young’s debut series is her powerful narrative voice and the landscape she sets her story in – harsh, bleak and beautifully evocative, three descriptors which one could also use to describe Raging Star as a whole. This is a UK-only giveaway. Sorry! What did you think about Raging Star? This is the first time i’ve heard of these books, but i’m a total book worm and would love to win them.